Indicators are made to let you easily read the market situation and based on that take your trading decisions. All our automatic strategies are based on one or more indicators we developed. Here’s a complete list of all our unique indicators. The Forex market is changing rapidly particularly in these years of crysis. Economics, politics, stock market, gold and oil, Forexâ€¦ everything is related. 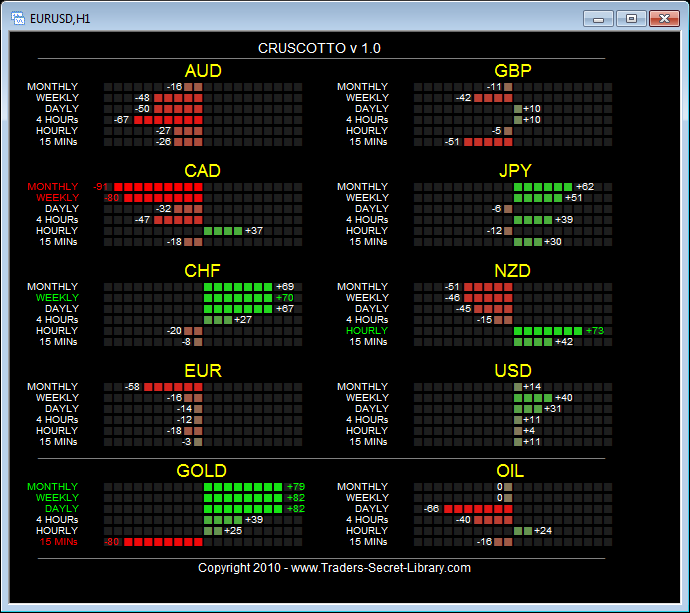 The Cruscotto is the ultimate currency strength/weakness indicator. It monitors the status of the 8 major currencies (and also gold and oil) in real time using the data coming from 6 different timeframes: from as short as 15 minutes up to a month of data. This will give you not only an overview of the currency situation, but also details on how it is performing in the short term as well. The strength/weakness score goes from -100 to 100 and is calculated using all the pairs in which the currency is involved it. So when for example you see a strong EUR and a weak USD that means that EUR is strong vs all the other currencies and vice versa for the USD. That makes a long trade on EURUSD much more interesting. I started developing Forex indicators more than 4 years ago now. And I soon realized that I had to develop something that could help me see the “whole picture”. I needed something able to show me the situation on multiple timeframes. Being able to reliably answer that simple question can make every trader a rich trader. Usually it is a matter of 50/50. We are trying to give you an edge. FuturoFX is the most advanced algorithm we wrote so far and what is does is giving you THAT edge. It scans the past history looking for strong correlations with the most recent price action. If it does find something interesting then it shows you what you can expect “in the future” given the current price behavior. how many times you’ve been told to be careful because a big news (usually NFP) is about to be released? How many times your trading has been caught into a spike in the opposite side due to a a news you didn’t think about? As traders and developers we know that and we usually put an option in our EAs in order to keep them “on hold” during such risky scenarios. But so far the only choice was a static option that required to be manually enabled/disabled when needed. We’ve been working on trading filters since the early days of PimpMyEA.com and we know well that the “news” filter is definitely one of the most asked and needed among trading filters. Recently we decided to tackle once and for all the problems related to news filters. We wanted to do something really useful and we are proud to say that we finally have a tool that meets all our requirements. And one big requirement was the possibility to integrate this “news” tool into our EAs. In the last months of development and trading we found out how much timing has a huge importance in trading and can make the difference between a winning trade and a loosing one. The problem is that most of the trading strategies rely on one timeframe, or at least one timeframe at a time. So far we’ve been able to do a multi currency analysis but we have done a step further: multi-currency and multi-timeframe. PowerBarsFX is the name of set of indicators that has the best of everything we learned and know so far, in it. PowerbarsFX indicators are aimed at giving a graphical representation of how single currencies are “moving” in all timeframes, from the faster ones to the slower ones. Seasonal patterns are some of the most powerful and least understood forces in financial markets. Some of the most well-known seasonal trends in Forex point to US dollar losses in the month of December and Japanese yen moves through the end of the Japanese fiscal year as exporters repatriate profits. But how can we turn these into winning strategies? What most people lack is a clear and simple way to analyze the Forex market and see in real time if a currency pair is following a specific seasonal pattern or not. Well that’s where we are here for! We just developed a new set of indicators that will let you do that kind of analysis over different timeframes. Have you ever wondered why the price has reached a certain level and then turned in the opposite direction? Well, those are named support and resistance levels. They are mainly psychological levels that the price “feels” when moving up and down. They are related to previous swing points (point where the price turned) or round numbers (like 1.3000 or 1.4000) or Fibonacci retracement levels. But they are not always easy to identify and sometimes, they are too discretional to be reliable. ResistenzaFX will greatly help you in finding them at any time frame, and it’ll show them to you in 3 different ways so that you can find the one that suits you best: histogram, banner and full screen. Did you ever wonder what’s the impact of news on each currency? And what about the start of each trading session (London, New York, Tokio)? How is each currency performing since the start of the week, of the month or even of the year? The answer to this questions can make the difference between entering with the odds on your side or not. ScissorsFX is made to answer all those questions and more. A powerful addition to all our other currency power analysis toosâ€¦ simply the missing view. The analysis is made based on time. Data sampling can be based on a specific timeframe or amount of ticks or seconds. SintesiFX is an indicator offering a “synthetic view” of the 8 major currencies: USD, EUR, GBP, JPY, CHF, CAD, AUD, NZD. You can choose the currency you want to focus on, just selecting it in the input parameters. Have you ever traded one currency pair like EURUSD while at the same time keeping an eye on what happens on other major pairs like GBPUSD, USDJPY, AUDUSD? You surely have noticed that the price movements on all pairs have some correlation, and if a breakout or a reversal on one pair is not followed by a similar breakout/reversal on the other pairs then in most cases you are seeing a false breakout or a false reversal. That typical “false move” that is just enough for triggering the stop loss of many inexperienced traders before the price resumes its “true” direction. If you have traded for any length of time you surely know what I’m talking about, and you surely have experienced the bad feeling of having being caught in a classic “trap”. 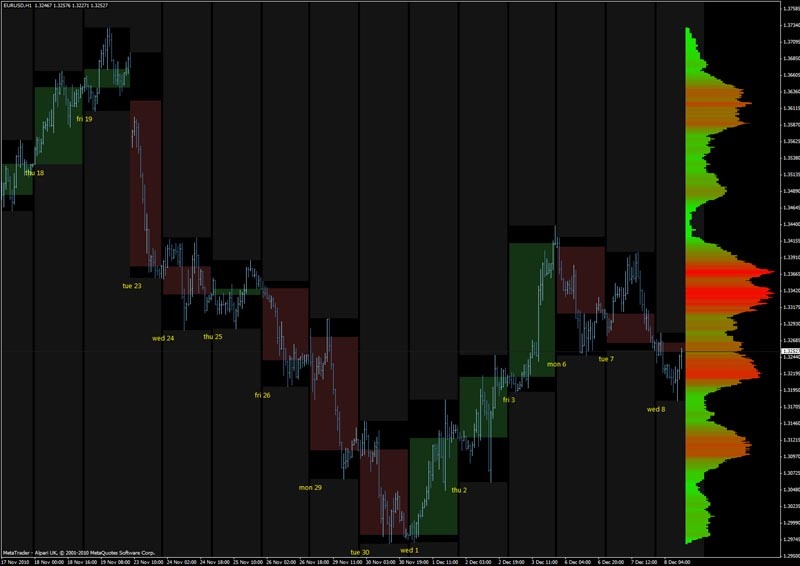 Now imagine you can easily look at your EURUSD chart with an indicator that tells you the “true story” about what’s happening on the other most important pairs related to EURUSD. An indicator that offers a realtime “synthetic view” of how money is flowing for EUR or for USD on the major currency pairs (EURUSD included). This indicator is “SintesiFX”. How many of you use moving averages (MAs) in their trading systems? How many times have you heard that MAs are not good as they “lag” too much? Starting from today we’ll show you that thanks to an innovative analysis of MAs you can be profitable even using just them. The indicators were obviously inspired by GMMA (Guppy Multiple Moving Average), however they introduce some new calculations for generating pretty interesting trading signals. We took the very good idea of rappresenting the two “sides” of the market: the long term traders and short term traders. By using two sets on MAs with different periods we can graphically see how they are “moving”. But this is not easy to trade as they are purely graphical rappresentation of the two sides. It’s not easy to understand when to enter, exit, trade or not trade. So we decided to find a way to “read” them in an undisputable way. And we created two new indicators for that. Forgot to ask you… Do you have a favorite zz indi? I have several but one I really like… I'm looking for another to add to find confluence between 2 zz with different approaches. If you have a favorite and would like to post… I would appreciate it. No I don't have a favorite. What I do is use 2 or 3 with different settings so that they confirm each other. Also I usually use previous high/low levels as entry points and not trading the change of trend immediately.